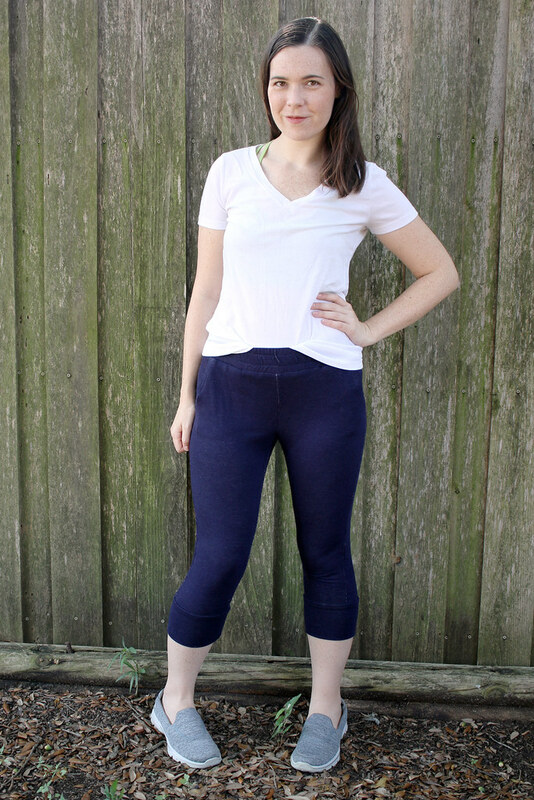 Another day, another activewear sewing project. What can I say? I’m obsessed. This time it’s a triple threat! 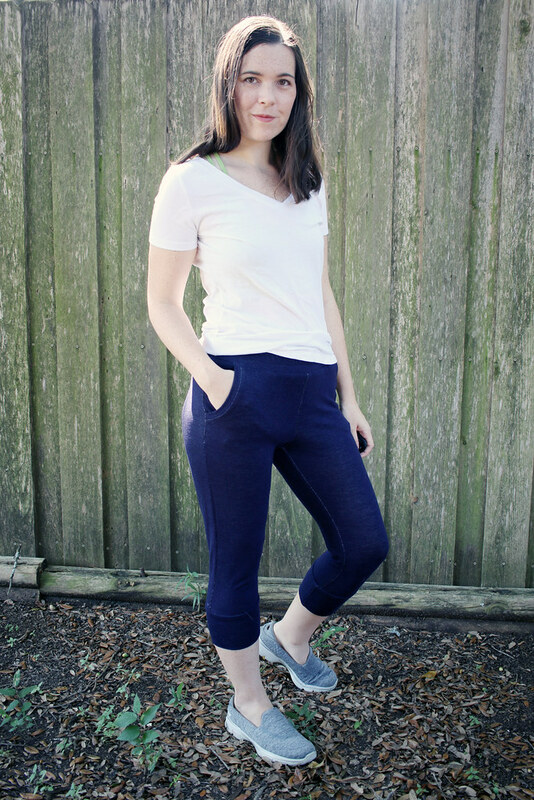 First up: the Sewaholic Pacific Leggings. 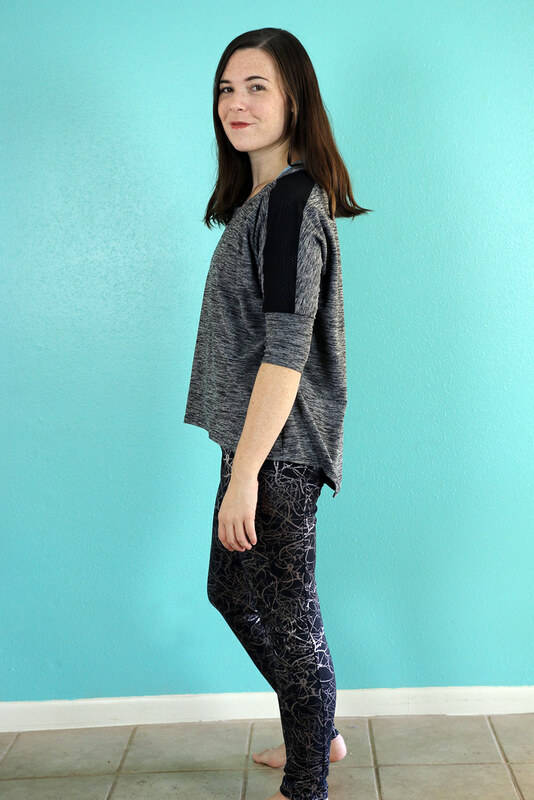 I made view C, the cropped leggings, with one big alteration: I slashed the back legs and added mesh panels behind the knees which echo the style lines in view B. One small alteration: I nixed the crotch gusset (the feature that made me excited to try this pattern) because, well, it was giving me some major foot-of-a-desert-pack-animal going on in front. Disappointing, but an easy fix as the legs can be sewn without the gusset with no need to alter the pattern pieces. 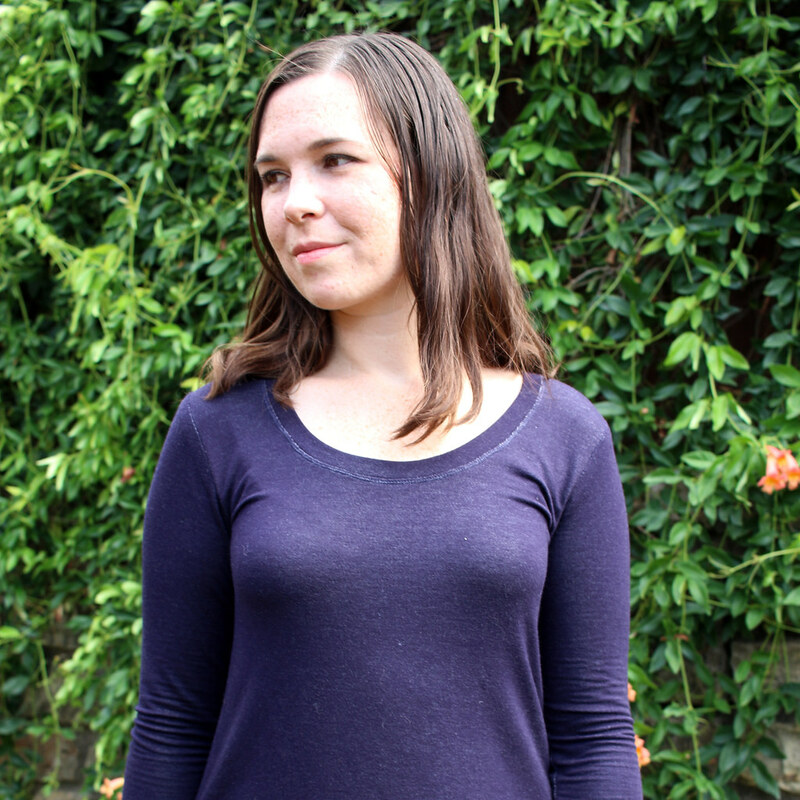 I liked the method of sewing the elastic into the waist yoke – makes for a clean finish with no visible stitching. And the curved seam lines are cool. They’re more visible in person. Next time I’ll try some contrast top stitching to highlight them. 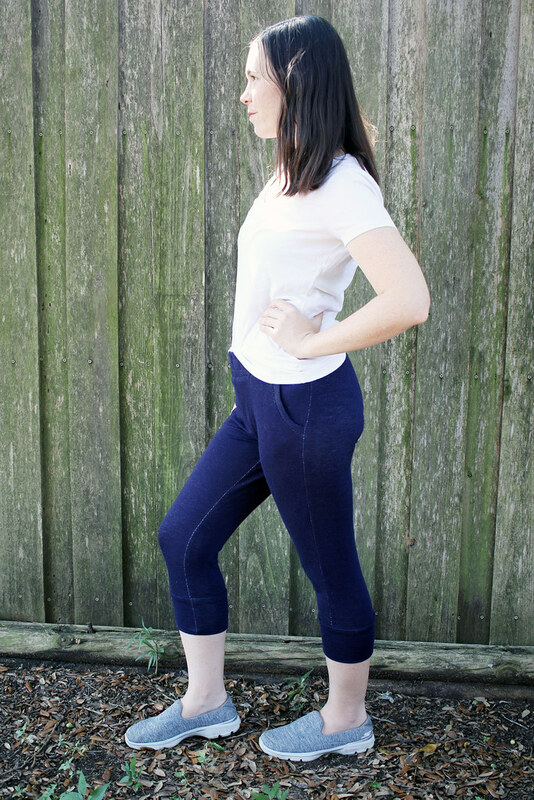 I didn’t make the back zippered pocket because I didn’t have a zip on hand and wanted to sew up these leggings immediately. Both the main heather gray/black fabric and the mesh came from Joann. Who knew they carry a whole activewear collection now? The black yoke fabric was scrap from Rockywoods.com. Hey Austinites! 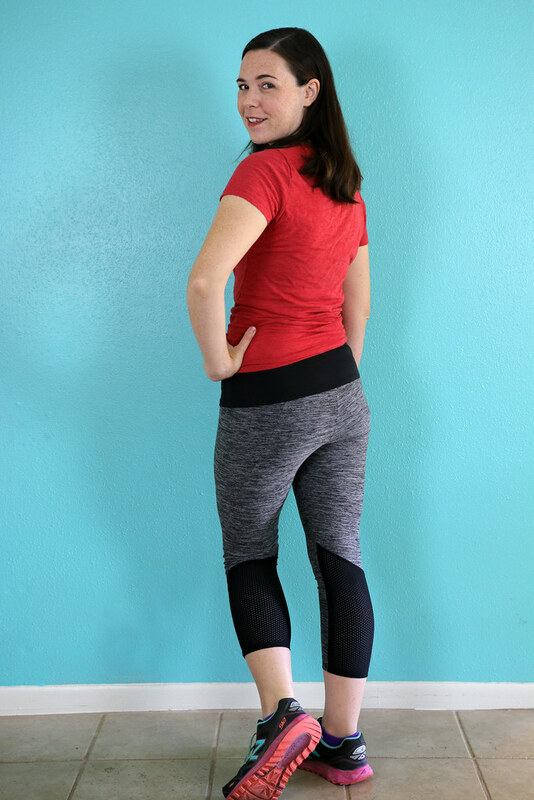 I’m teaching a class on the Pacific Leggings at The Cloth Pocket on December 13th and 15th. Sign up here! 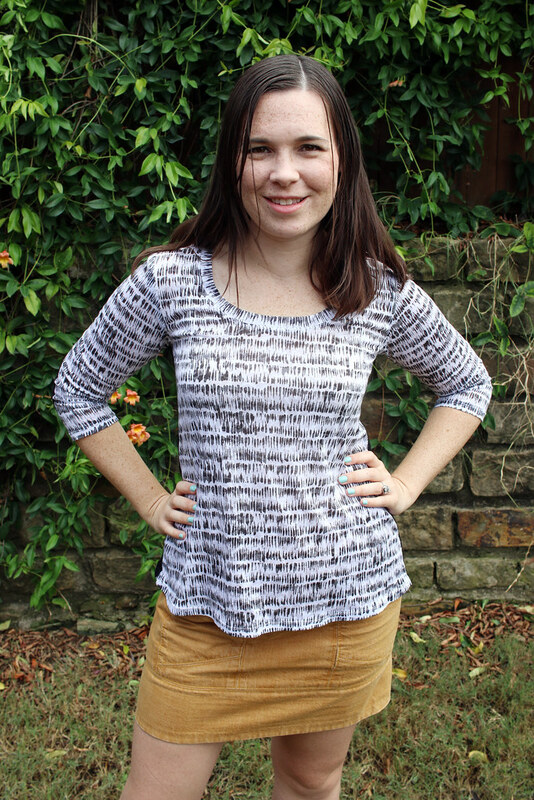 Using the same heathered fabric and mesh I made an altered version of View A of Simplicity 1463. 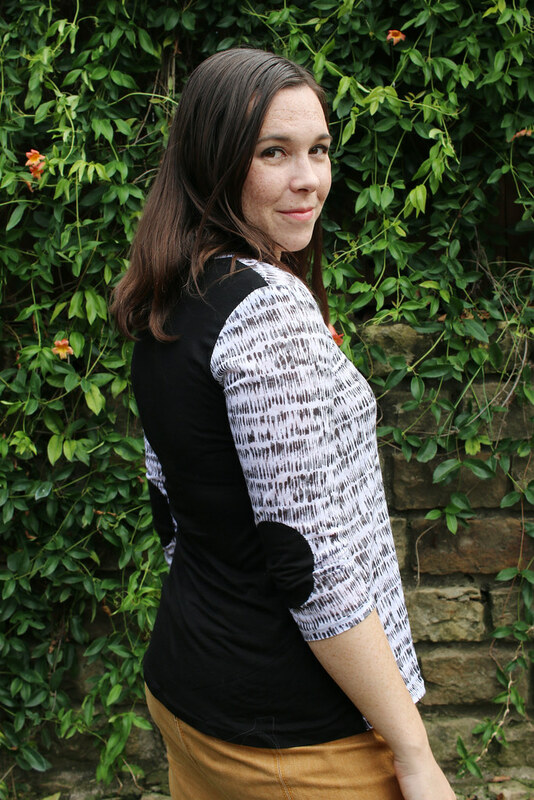 I altered the pattern to add the mesh shoulder panels by slicing off the top of the front and back pieces by 1.5″+seam allowance. Then I cut 3″+seam allowance-wide mesh strips to insert between the front and back pieces at the shoulder seam. I topstitched the seam allowance along the mesh panel to keep everything nice and flat. The mesh adds a fun sporty touch. Ok, so here’s my problem with this pattern: the sleeve cuffs end right at the elbow. Not above or below so I feel like I constantly have to adjust the sleeves but pushing them up or down. If I pull them down below the elbow, it pulls at the neckline. If I push them up, the fabric above the cuff bunches up, but this is my preferred way to wear the top. 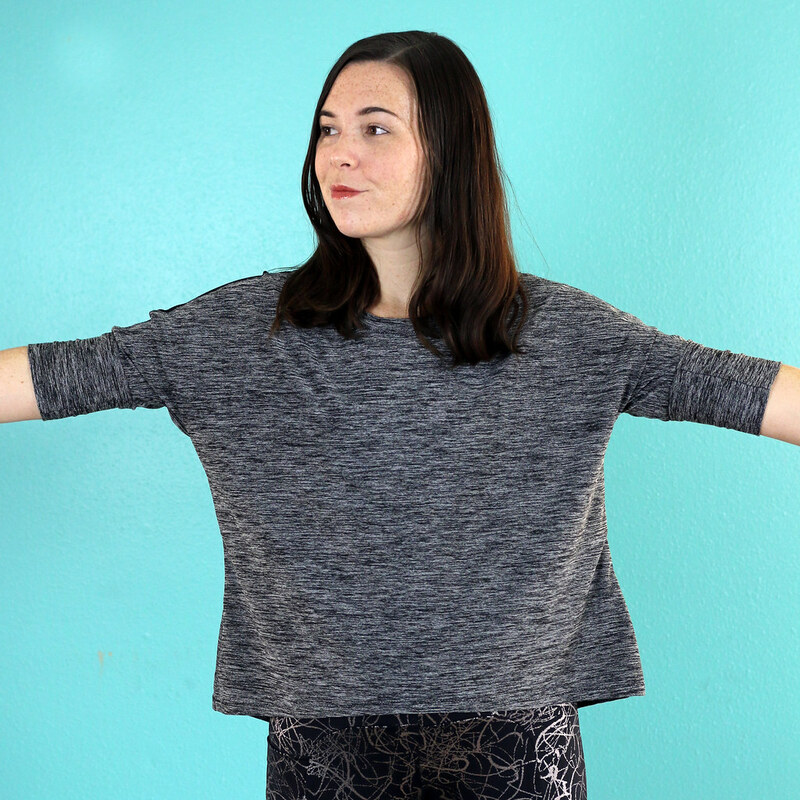 If I were to use this pattern again, I’d shorten the cuff and the length of the sleeve portion of the top so that they ends above the elbow instead of some kind of bendy no-man’s land. 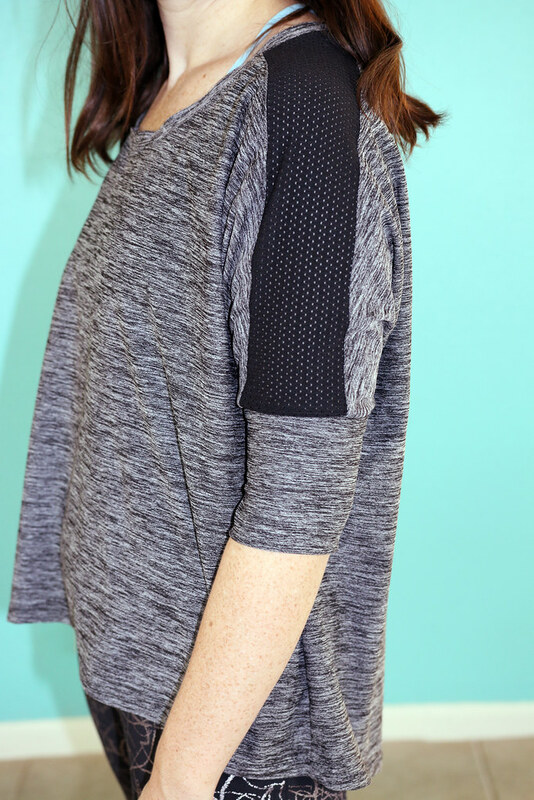 I can wear this top to a dance class or for Krav Maga and maybe as a popover for running on cooler mornings. 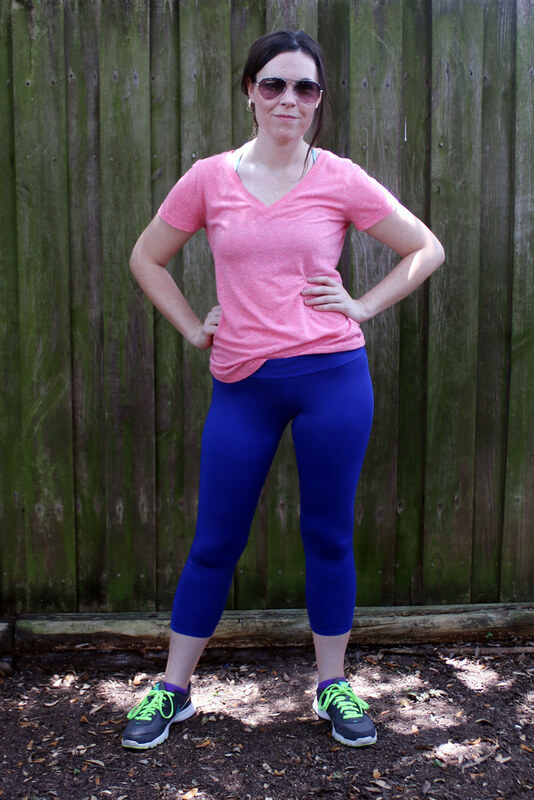 Lastly, using more fabric found at Joann, I made a pair of McCall’s 7446 leggings. This fabric features a metallic gold swirl pattern on black that I loved but it doesn’t show the seam lines of this pattern well. The curved seam reminded me a lot of Papercut Pattern’s Ohh La Leggings which I have made before. There are some things about this pattern that I like more than Papercut and vice versa. I liked the McCall’s pattern’s side pocket along the leg. I haven’t make a pair of leggings with that style pocket before but it works great for holding keys or your phone. The curve along the bum reaches higher in the McCall’s than the OLL, which I prefer. I can feel the curve on the OLLs when I sit down and I prefer the look of the higher curve. 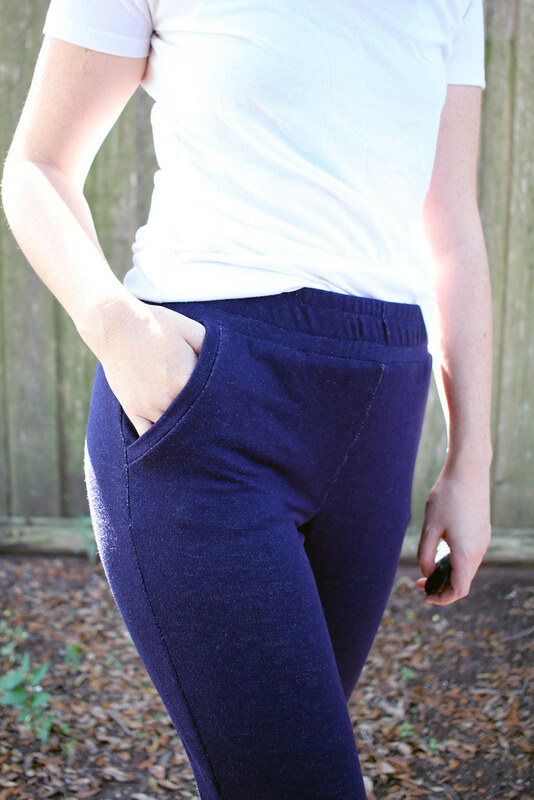 The OLLs use a folded over elastic waist while the McCall’s uses and un-supported waistband. The band is a little too thick so it likes to bend over on itself and doesn’t want to stay flat. I prefer the OLL waist method. If you don’t count the waistband, both patterns have the same number of pieces but the OLLs don’t have side seams on the legs (which is silly, those McCall’s side seams don’t give any shape to the legs. The front and back side pieces should have just been combined into one piece, unless you’re going for extreme color blocking). I think the OLL are easier to cut out and quicker to sew. In the end, I like my sparkly gold leggings even if the construction could have been simplified. 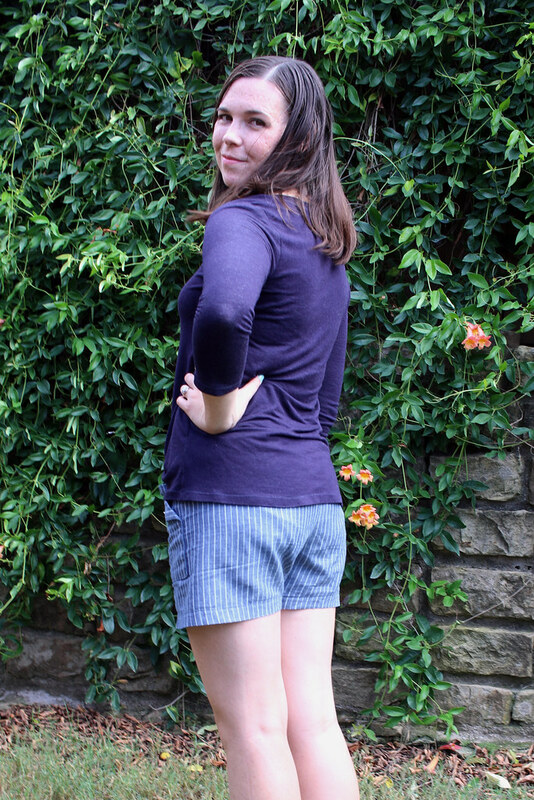 If I want another pair in this style I think I’ll alter the OLLs and add a pocket if needed. These are my third True Bias Hudson Pants and my first capri version. 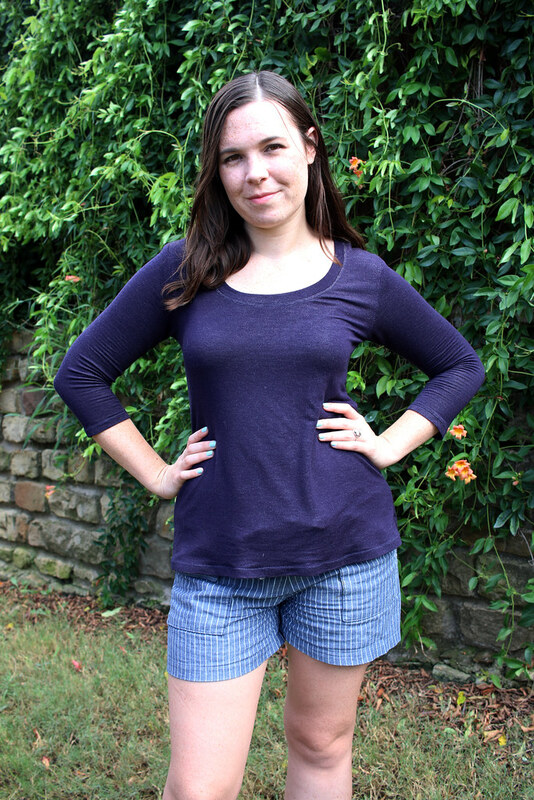 They’re made from a super soft and lightweight “denim” French terry from LA Finch Fabrics that I also used for this Plantain shirt. I cut a size 4 so they’re pretty slim fitting and I also adjusted the front crotch curve to get rid of some excess fabric in the center. Other than that, the only change I made was omitting the drawstring. 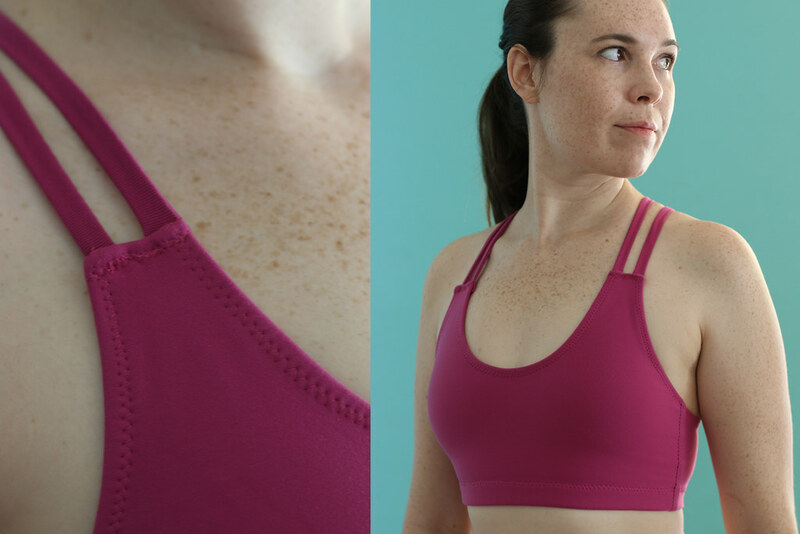 These two sports bras are made with Papercut Patterns’ Pneuma Tank pattern. Both were sewn months ago and are in heavy rotation. They’re definitely my favorite sports bras that I own. The fabric is fantastic – two colors of a lovely supplex nylon knit from Rockywoods.com. 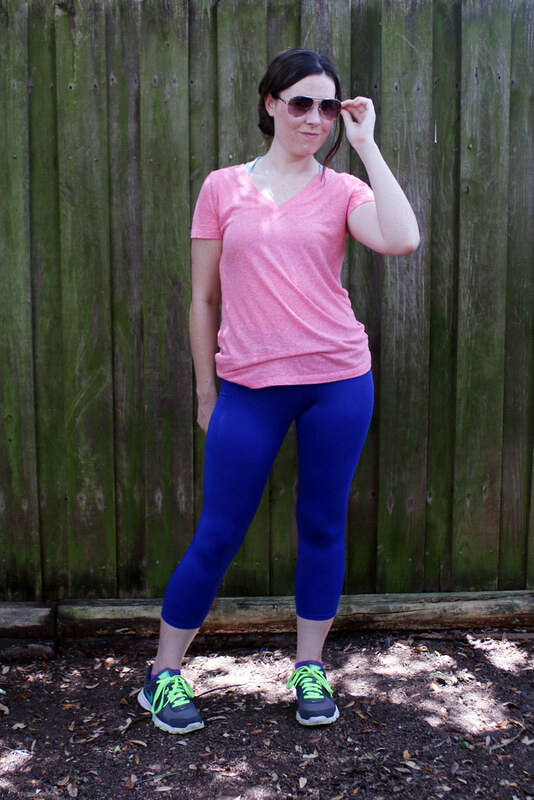 I used the fuschia for these leggings. I doubled the fabric on the front half of the bra to add extra support. 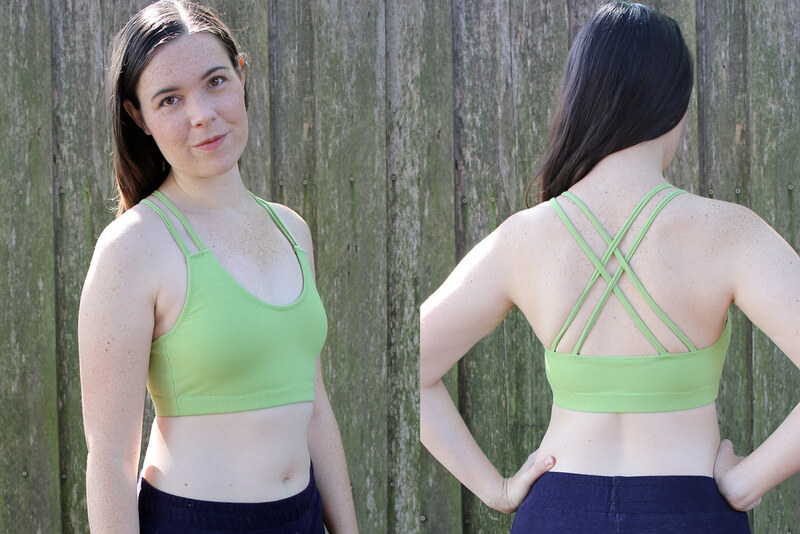 Instead of using bra-strapping I made narrow tubes of self fabric for the criss -cross straps. I have enough of the green fabric left to maybe make another sports bra. I might try a cropped version of Fehr Trade’s XYT Workout Top. 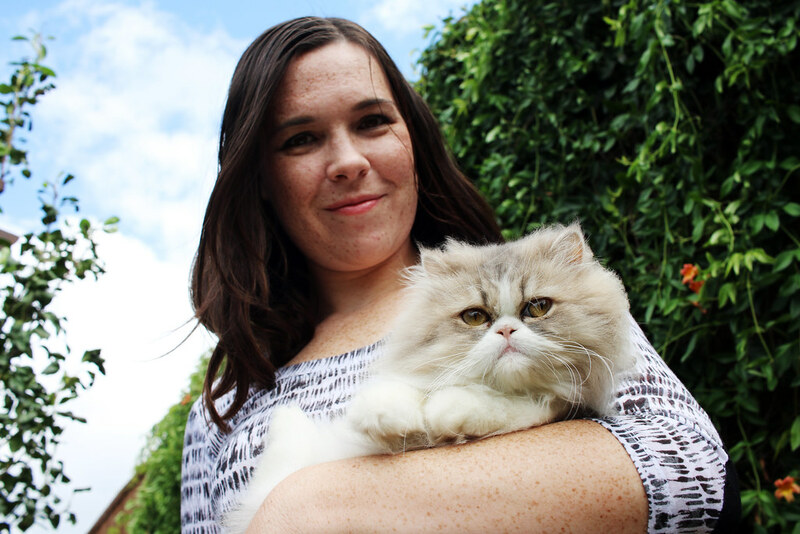 This post has an extra special appearance from Betsy – my relative’s adorable fluffy Persian kitty. 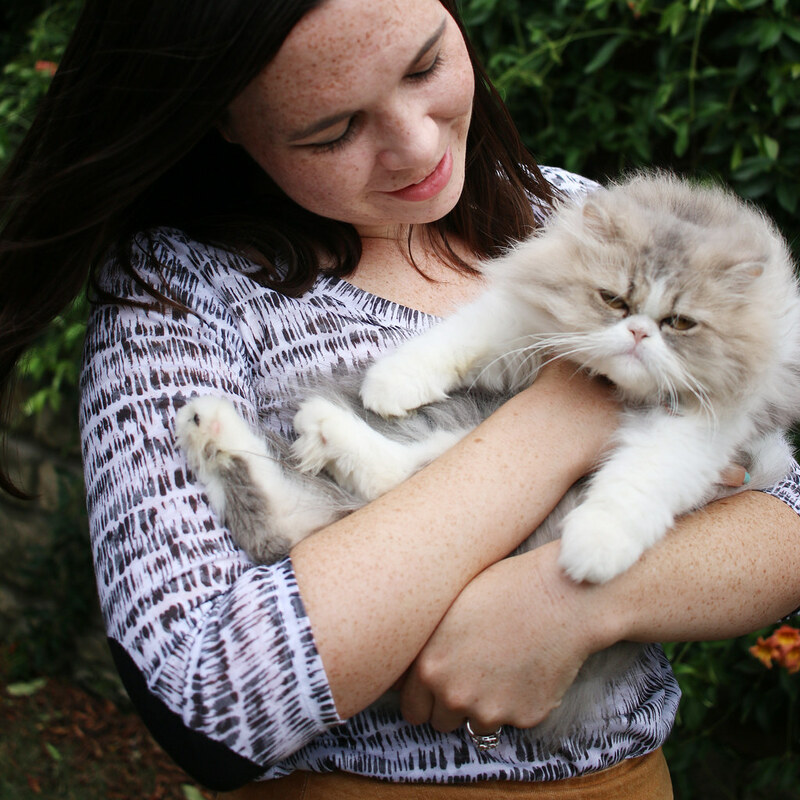 I can’t tell if she’s annoyed with me holding her because her face always looks like that. Either way, she’s super nice. 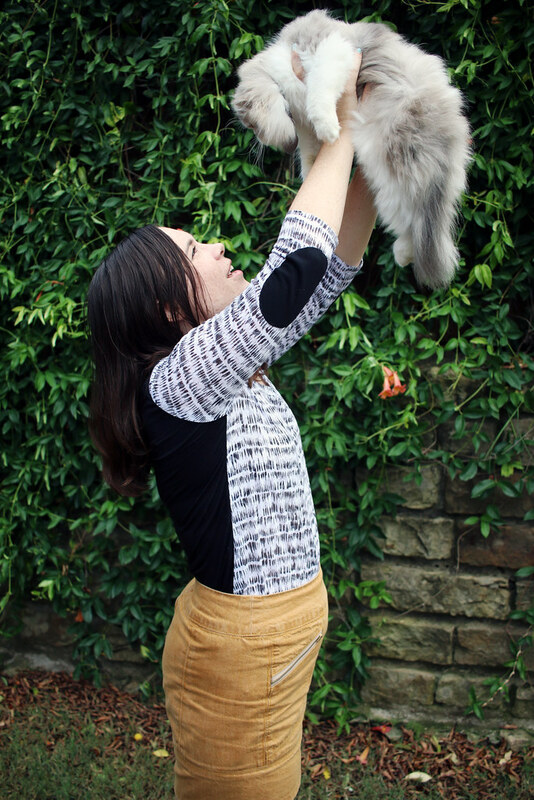 My cat, Peanut, would never let me hold her like this. Both of the knits for these two shirts are from LAFinchFabrics.com. I bought them for other projects which have been cut out but not yet sewn. Luckily I had enough left to make a couple Plantains – the free shirt pattern from Deer and Doe. This shirt is made with a lightweight but pretty stable cotton poly blend jersey with a very slight, barely noticeable burnout. Best of all it was THREE DOLLARS for two yards! Let me repeat that – THREE WHOLE AMERICAN DOLLARS (plus shipping obvs)!!!!! Unfortunately, I didn’t have enough leftover fabric for the back but I had just enough of some scrap black rayon jersey that was nearly the same weight. I also used that black to cut out the elbow patches. I didn’t make any fit changes other than grading between sizes from the waist to hips. 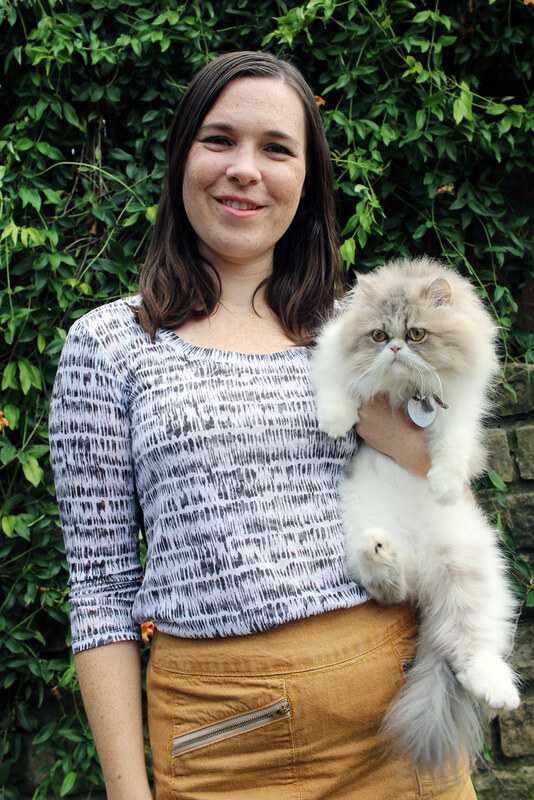 I like the way the shirt flares at the hem – good for a pear shape like me. 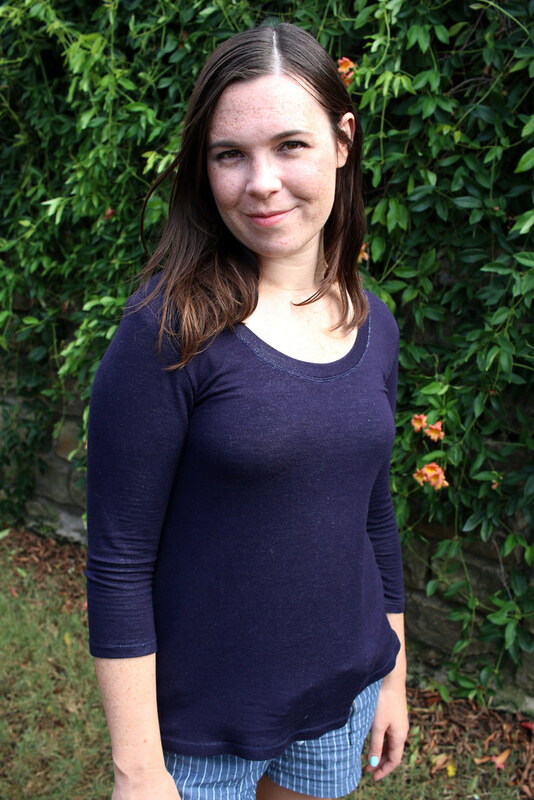 This one used a denim (it’s a heather-ish blue on the outside, white on the underside) french terry that is super lightweight and drapey. It’s like it was made for this pattern. Too bad it’s now sold out. My serger is on the fritz right now so I sewed both of these with a zig zag on my regular machine and used a twin needle on the hems and collar. One thing I loved about this pattern is the neckline. I like the wide round shape and the collars on both shirts sit nice and flat. 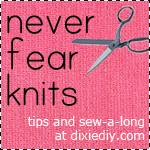 I know every knit is different and there’s no way of knowing if a pattern’s collar piece is going to be too long, too short, or just right. It’s often trial and error, but for both shirts the length was perfect. 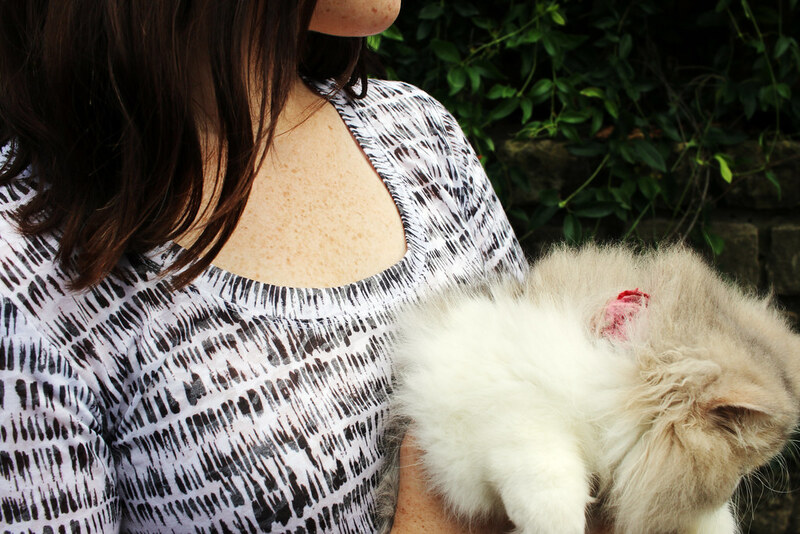 Like, it’s the Goldilocks collar! Sometimes you need a quick sewing project to get your sewjo back. I hadn’t made the Plantain before but both of these shirts came together in only a few hours. Yep, I’m on a roll and perhaps even a little obsessed. Most of my sewing the past couple months has been geared toward some type of sports, exercise or outdoorsy-ness. Sorry, not sorry. This is my first Patterns for Pirates make and it’s pretty successful. 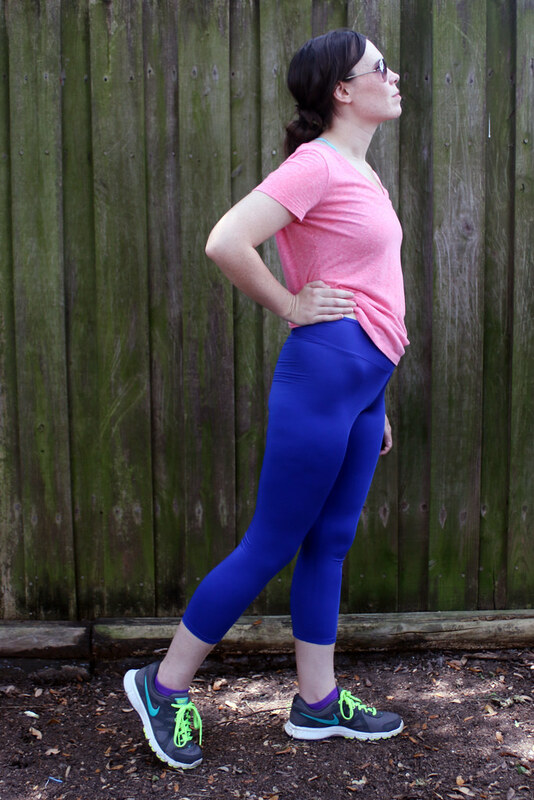 These are the Peg Legs – a simple leggings pattern with no side seams (yay!) and no waistband elastic (double yay!). The fabric is again from Rockywoods.com (gotta maximize that shipping!). It’s a fancy UnderArmor HeatGear poly/elastane knit with SPF 50+ and wicking ability and all that cool stuff. I made a size medium, capri length but this fabric is so stretchy the legs could easily stretch to my ankles. My only struggle with this pattern wasn’t with the design itself but the assembly. P4P uses “no trim” printing pages. You just line up the edges. At first I thought this was cool, no cutting! But my printer doesn’t print less than ~3/4″ from the edge in any direction. That means lots of edges got cut off including most of the page numbers. For example – is this a B or a D? I’m pretty sure it’s a 4?? Who knows!? In the top corners, printed numbers 1, 4 and 7 get so truncated that I can’t tell them apart. A page number printed in the center of the page (like a watermark) would have helped. There wasn’t even a full page layout image included in the instructions to which I could compare my printed sheets!! Ugh, that annoyed me. Luckily there weren’t many sheets as this pattern is only one piece (you cut the legs shorter for the four length options and the waistband is just a rectangle you cut out separately) and the pattern tells you not to print a couple pages if you’re below a certain size. If I were to make these again I would even out the rise between the front and the back. The back waist is a little high for me and the front waist is a little low. 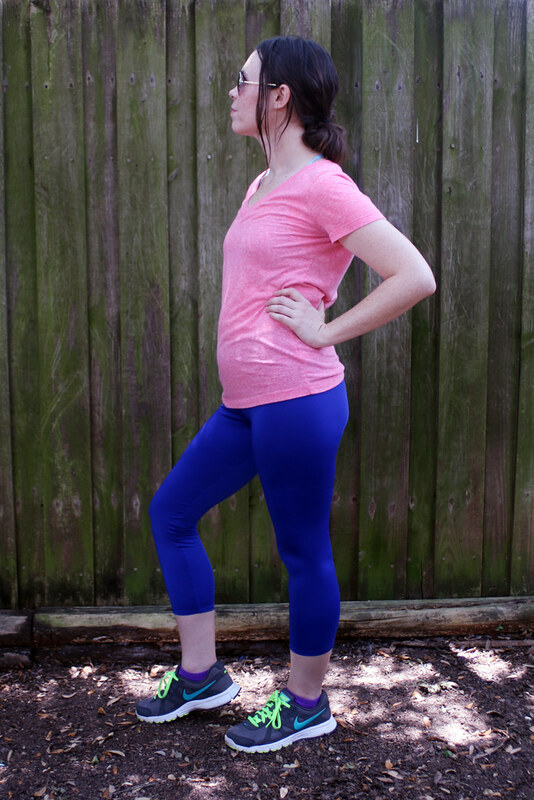 Since these leggings have no pockets for keys they’ll probably be relegated to yoga/exercise rather than running. 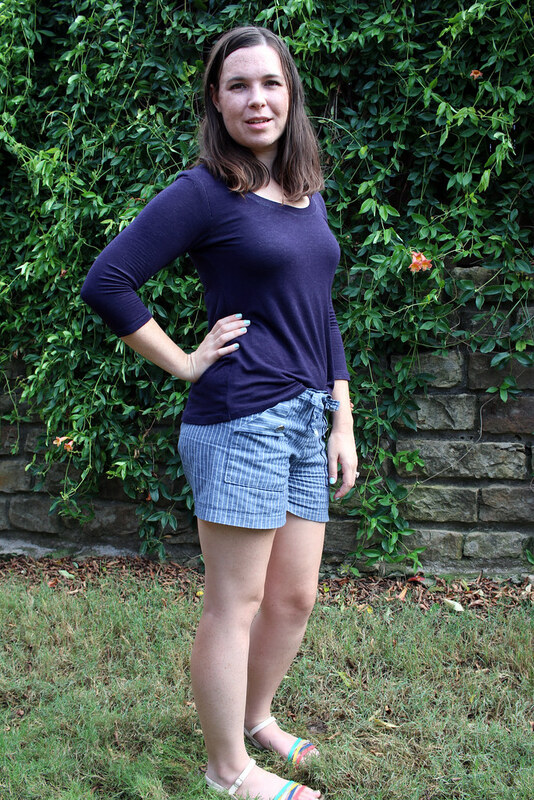 These were a fun pair to whip together in an afternoon – few pieces and even fewer seams! But they’re a little plain. 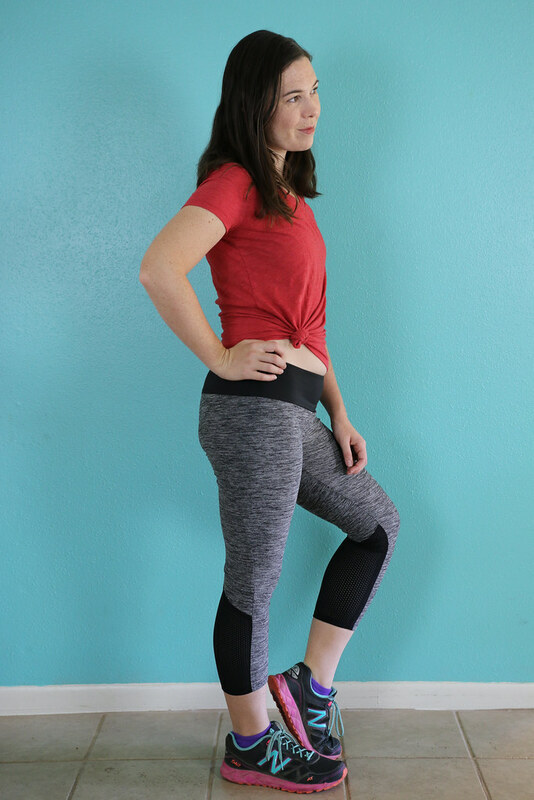 Next time I want to try the Sewaholic Pacific Leggings as they have more decorative seaming and a back zip pocket at the waistband, better for running.